Thanks to all who joined in the chat. @clissa89, @BillWongOT, @Kirstyes, @fullyoccupied, @HelenOTUK, @xJessicaKate18, @RedTedArt, @ShortShannon8, @AOTAinc, @LeonoraOT, @Lottie01. This was a great #occhat and the topic generated lots of interest and it seems clear that Arts and Crafts our still important tools in the OT toolbox. Tweeters shared many examples of how these used arts and crafts in their OT practice and discussed many factors which should be considered when using them. I would usually separate the tweets into themes, however the discussion was lively and the topics and themes often interlinked. It seems more appropriate to keep the chat in order of flow. I have highlighted some key points throughout. There was some discussion about linking the theory to practice, and justifying the use of crafts with clients. Also overcoming barriers, such as other professions not understanding, and the skill level required of the occupational therapist. 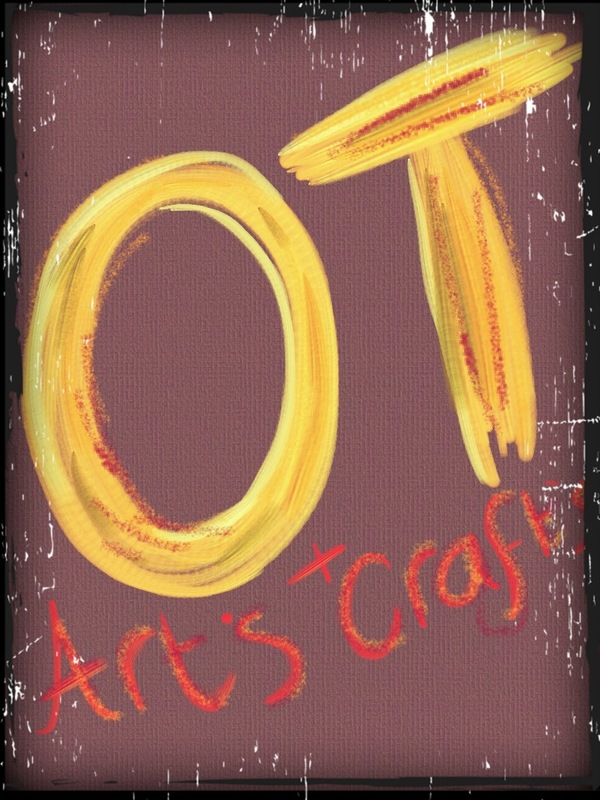 #occhat does anybody use arts and crafts in their OT practice? how and why? if not why not? Examples of use in practice – various client groups and settings. Use as a communication aid and examples of clients teaching OT the skills they enjoy. The importance of meaningful occupation not just doing for the sake of doing. #occhat i enjoy scrapbooking, knitting, painting, drawing… probably lots more… but not particularly skilled. @BillWongOT @gilliancrossley #occhat maybe learning something together or having service user teach you could be v powerful and equalising? @gilliancrossley #occhat it’s one of my fave -‘ let’s get a burst of new enthusiasm’ sources! Practice examples continued in relation to various client groups, some things in included: Sensory, fine motor, memory, social skills, self esteem, transition, flow and wellbeing. Some discussion regards age/ skill appropriateness. @gilliancrossley #occhat I used arts and crafts w pediatrics to work on many different things from fine motor to hand eye coordination. Some discussion about the types of materials used, for example adding scent to fabric memory books, use of recycled goods. Being aware of infection control policy when using recycling and how an activity can be made age appropriate with careful consideration of the materials used. #occhat or make sensory crafts! #occhat can someone please explain pintrest to me? @RedTedArt #occhat already have! Loved doing it with paed pmld – so messy! #occhat uk folk bbc4 now!!!!! Exactly in subject! OT just need to be able to facilitate – high level of skill could but client off. @BillWong I hated arts and craft, a client got me into scrapbooking! #occhat #hopeforyouyet ! RT @xJessicaKate18x @BillWong I hated arts and craft, a client got me into scrapbooking! #occhat#hopeforyouyet ! Example of crafts supporting a family to reconnect. Combining crafts with working on occupational performance skills, such as – reaching, positioning and strengthening. #occhat I like arts and crafts because U can combine them w so many other aspects like standing, positioning, and strengthening. #occhat @gilliancrossley @clissa89 @kirstyes I think for arts and crafts in the modern age we musn’t forget photography and it’s editing! @fullyOccupied @clissa89 @billwongot @boothrach #occhat does anyone have a good reference for the’ just right challenge’ ? #occhat RT @BoothRach : @BillWongOT @clissa89 not sure I follow a service user would only engage in a group/activity if they wanted to? great #occhat any final thought? comment? The tools of our trade. Brilliant #occhat thanks everyone…going to carry on with some scrapbooking right now! http://t.co/Cv0ty6vw pinterest group OT board #occhat . fantastic resource! #OTalk 25/09/2012 ‘Keep Talking’ – Professionalism.